Ndicho, whose family lives in a simple boma in the Olmoti region, wants to be a doctor and give back to her community, an impossible dream without the education she is receiving, thanks to Susan’s sponsorship. 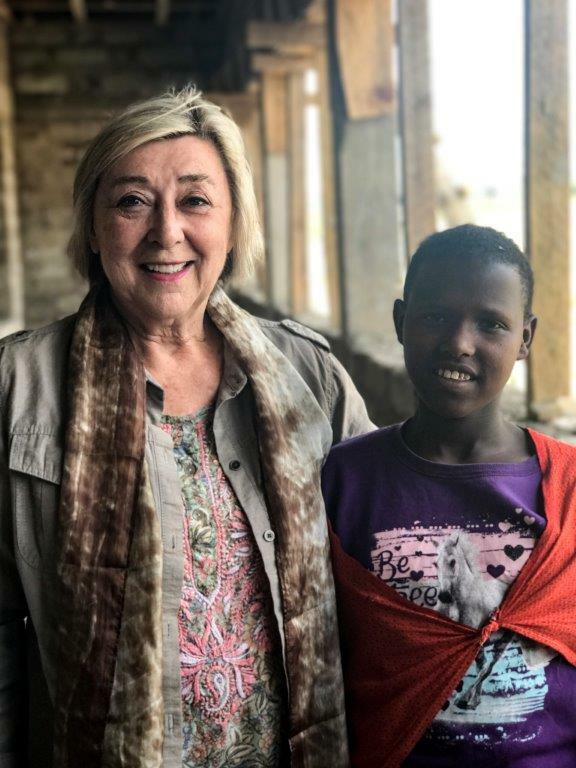 “Her smile lights up the room.” When Susan Finlay Marrinan met Ndicho Kiluso for the first time, in June of 2017, the young Maasai teen was a bit shy. Susan was thrilled to meet her in person -- the girl she had arranged to sponsor in high school through Olmoti Clinic’s “Pathway of Hope” program. She was quiet but, "Her enthusiasm was infectuous," Susan recounts. The two met when Susan was visiting Olmoti with The Olmoti Safari and cultural tour. Ndicho arrived at the new Olmoti primary school near the clinic in a purple t-shirt and red cloak, her hair shorn in traditional Maasai fashion. She was “engaging and filled with vitality, energy and life,” as they greeted each other, Susan recalled. Ndicho is one of countless Maasai girls who without the Pathway of Hope – now Girl Phenom -- program, and a dedicated sponsor like Susan, would be unable to attend high school, and would instead be consigned to early marriage and childbirth and a life of poverty – the story of women and girls in Maasai culture. The program sponsors Olmoti/Elerai girls at MWEDO girls' high school in Arusha, which opens a new world to them and a chance to achieve their potential and their dreams. Ndicho, whose family lives in a simple boma in the Olmoti region, wants to be a doctor and give back to her community, an impossible dream without the education she is receiving, thanks to Susan’s sponsorship. She expressed her excitement about school, and, in gratitude, placed a hand-made Maasai beaded necklace around Susan’s neck. Touched by her thoughtfulness, Susan gave the girl a school backpack and supplies she had brought from California. Ndicho is an eager learner and her teachers report she shows great promise.